We've tried growing mushrooms twice before, with zero luck. We've used old logs, fresh logs, oak, ash. We've tried them in different places in our yard. no go. 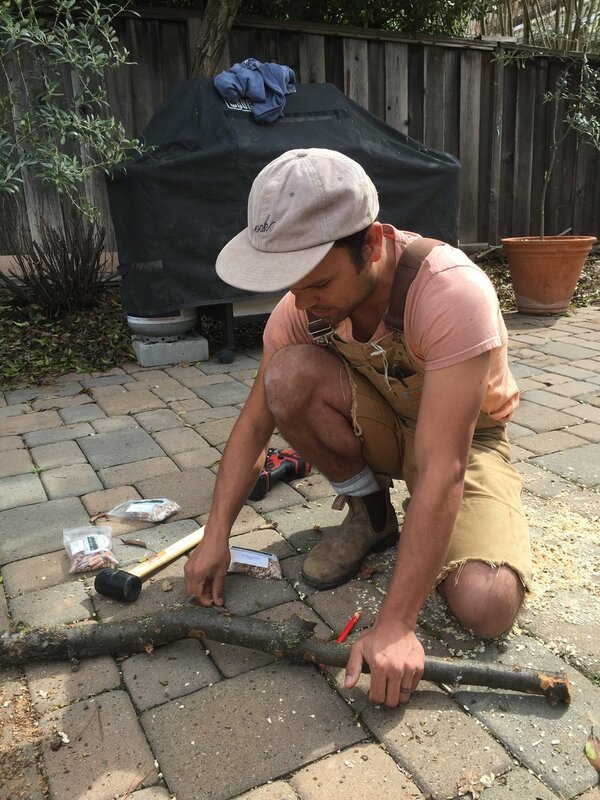 Mostly I think it's too hot here, but I wanted to try one more time, make sure to place the logs in a very very shady place, and use water from the rain barrel (not the municipal system), and see if we can't make it happen. So again I ordered plug spawn from Fungi Perfecti in the Pacific Northwest. The last two times we tried shiitake, so I ordered oyster spawn this time, hoping for a different result. An arborist pruned our oak this past Monday, so I saved some thicker branches, and also got some older Coast Live Oak logs from my parent's property. I invited a classmate from my school, who has also always wanted to try this - he brought the entertainment, his adorable three-year old daughter. Who, it must be said, was completely indifferent to the project, and preferred coloring. My friend brought some more plug spawn - Shiitake, Reishi, and Lion's Mane. So we had a lot of variety to choose from. The process really couldn't be simpler; you just drill holes (5/16th bit), hammer the plugs in with a mallet, and seal the holes with melted wax. For the logs we kept, we made a makeshift rack to place them on so they are off the ground, in the deep shade under the ceanothus. My friend took his home to Oakland where they will likely fare better. I vow to water mine every day. And cross my fingers. Here is a picture from Sharondale Mushroom Farm in Virginia - this is how they look when they fruit. I can only hope we will have a similar picture next winter. I have contacted a local mushroom farm, Far West Fungi, to see if I can visit and have a tour. If so, you know I'll share the journey with you! Have you grown mushrooms successfully? I'd love to hear more about it.